Can You Believe It's True? 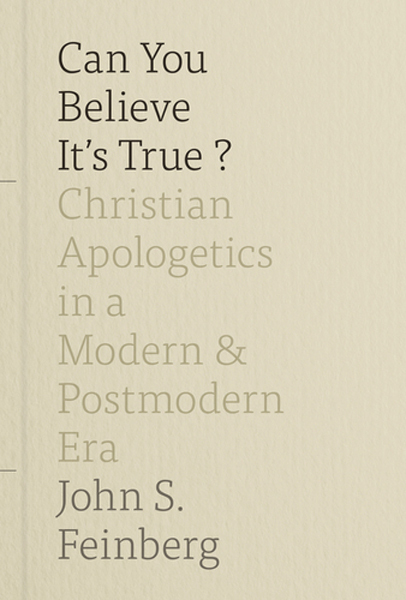 Christian Apologetics in a Modern and Postmodern Era is really a book about truth: "even though this is a book is usable as a general text in apologetics, the greatest burden and passion of the book is to defend the notions that there is truth, humans can find it, and we can "know that we know" what is true" (p.11). Feinberg's interlocutors for his discussion are skeptics, those who resist Christian claims to truth. In our contemporary setting, such skeptics come in two flavors - modern and postmodern. Modern skeptics regard the claims of the Christian to be unsupported by the evidence. Postmodern skeptics, on the other hand, are suspicious of human claims to know any objective truth. Feinberg begins with the latter. Postmoderns are unwilling to engage in truth claims because they are skeptical that there is such a thing as truth or deny that, even if there is such a thing as truth, human beings are able to know it. Postmoderns emphasize that human beings are conditioned by experiences, biases and culture. Such conditioning renders human beings unable to offer more than a perspective on reality. Consequently, Feinberg reminds us, postmoderns deny that humans can acquire objective truth. Feinberg's response is to argue that there is an obligation upon human beings of all cultures and backgrounds to be logical and that objectivity is possible. What is it that obliges a person to be logical? Feinberg has six answers. First, laws of logic, particularly the law of non-contradiction, accurately describe the way the world is. For example, it is not possible for one person to be in two distinct places at the same time. Language relies on this fundamental assumption and without it we would be unable to communicate at all. Second, everyone can see or sense when a logical fallacy has been committed, especially when such a fallacy directly effects them. To do away with the binding nature of logic would be to allow fallacious reasoning to be justified. Third, even if there appear to be contradictory states of affairs in the world, the burden of proof is on the one saying a contradiction has been discovered. No one, Feinberg reminds us, has ever found a contradiction in the world. Fourth, there simply is no other way of knowing apart from our reasoning and our observation. For those who propose such a thing, it is up to them to describe what it is. Fifth, it is possible to hold beliefs that are partially true and partially false, but this in no way means that you are not obliged to continue to attempt come to true beliefs. Finally, although you are welcome to believe anything you want, you cannot live in another world. Reality being what it is, you are obliged to live in accordance with it. Feinberg's overarching point is that reasoning is not culture relative, logic is not merely "Western." It is binding for all people who live on planet earth. This is the central obligation governing all people - to think logically. If we are obliged to think logically about the world, then the next question is whether knowing anything about the world is possible. This, Feinberg suggests, comes down to objectivity. Can we distinguish between what is known objectively and what is known subjectively? Feinberg's analyses various notions of objectivity and subjectivity and summarizes the postmodern problem with objectivity as the problems of "theory-ladenness" and "perspectivalism." Theory-ladenness stems from the idea that no one approaches knowledge from a neutral standpoint: "everyone has presuppositions about the nature of reality. These assumptions...result from our beliefs, our experiences in life, the time and culture in which we live, and the linguistic community in which we were raised and continue to live... The problem is that our mind is active in the process of sense perception" (p.111). If we all impose our conceptual grip upon evidence, then coming to an objective perspective would be impossible. Not so argues Feinberg. Feinberg suggests that while it is certainly true that we do not approach anything devoid of assumptions, that does not entail that we are unable to come to objective truth in any sense. Feinberg draws on the work of Israel Scheffler to show that there is a distinction between having assumptions and applying assumptions. Assumptions, Feinberg suggests, are generated by acquiring a conceptual grid, a mental filing cabinet by which we make sense of experience. However, just because a person has acquired such a grid, this does not doom him to be unable to accept new categories and new ways to think about the world. Such presuppositions can be set aside to examine evidence in a fair manner. Consequently, "persuasion is not impossible just because a nonbeliever's paradigm differs from that of a believer. And the reason is not just that the Holy Spirit will help us "get through" to the nonbeliever. It is also that nonbelievers can understand what we say and can evaluate our arguments and evidence with fairness" (p.127). The second question is a question of perspective. Just because we might be able to know what our assumptions are and put them to one side, there is no guarantee that our perspective is the right one, we simply don't have a transcendent "god's eye view" on matters. If that is true, we might find ourselves bound by such a perspective with no way to adjudicate between two differing perspectives. Feinberg responds by saying that there are indeed many things we can know that don't depend on having a "god's eye view." Most obviously, argues Feinberg, everyone knows that we have, as human beings, the capacity to reason and to observe the world. If we begin with this assumption and not with assumptions about the world, then we can all, regardless of perspective, come to agree on certain facts in the world. The mistake, Feinberg argues is that we often begin with presuppositions of content rather than method (see my recent post on this matter here). If we begin with assuring each other that reasoning and observation are capable of determining what is true and false rather than which set of beliefs render a better perspective we are more likely to reach true conclusions. In the same way we might determine whether or not unicorns exist, we can determine the truth or falsity of any claim, even a Christian claim. As one can see, there is very little in Feinberg's analysis and response to postmodern skepticism that has very much to do with whether or not Christianity is true. This is because, Feinberg suggests, postmoderns are not really going to be interested in whether or not something is true prior to being persuaded that there is such a thing as truth and that it is possible for human beings to know truth. In confronting modern skepticism, on the other hand, one must attempt to provide a positive case for the truth of Christian theism - amass a certain amount of evidence that is sufficient in quality and in relevance to oblige a person to commit to a belief that Christian theism is true. One determined to make a case for Christian theism should ask themselves three questions about the evidence they want to use: 1) Is it true? 2) Is it relevant and 3) How much does the evidence prove? Feinberg offers an excellent survey of what we mean by certainty (objective and subjective). This issue of doubt and certainty is at the heart of modern epistemology, beginning with Descartes. Feinberg concludes that objective certainty is possible if conceived as maximal probability (99%). "If he's not satisfied by the series of explanations, arguments, and evidences we offer, what would satisfy him? If he knows, he may realize he already has the "final" explanation or proof. If he doesn't know what it would look like, he probably won't recognize it when he sees it" (p. 183). Feinberg's point is that an argument is not defeated if the objector wants something other than good evidence. The objector, devoid of grounds to doubt, doubts all the same despite the evidence. This is the end of the road for the apologist, who has played his part. The second part of the book deals with three general strategies for a Christian apologetic, Reformed Epistemology, Presuppostionalism and Evidentialism. He then sets out his own evidentialist approach. I plan to respond more fully to Feinberg's criticisms of presuppostionalism in another post so let me summarize Feinberg's own strategy. Feinberg's evidentialist approach is a cumulative case strategy. It is an informal argument, or a series of informal arguments, that, together, present the best explanation for a given fact or experience. There are, however, some essential Christian claims that must be defended in a cumulative case apologetic. First, the reliability of the Bible, beginning with a historical case for the reliability of the Gospels. Second, a defense of the veracity of the resurrection of Christ and, more broadly, for miracles. Third, a cumulative case approach should also seek to answer common objections such as the problem of evil or the problem of religious pluralism. Feinberg's final chapters are devoted to demonstrating these essential elements in his strategy - the problem of evil, the reliability of the Gospels, the resurrection of Christ and religious pluralism. One might wonder whether anything in Feinberg's strategy attempts to respond to the postmodern skeptic with which he began. Feinberg admits that his apologetic strategy is to respond to modern objections, de facto questions. However, Feinberg suggests that his response to postmoderns found in the first chapter is an evidentialist response and demonstrates the method in that context. Feinberg's strategy, then, includes an argument made to postmoderns to accept a form of modern epistemology so that an evidential case can be made for Christianity. It is also not a strategy designed to incorporate deductive arguments for general theism before making historical arguments for Christian theism. Feinberg distrust's the usefulness of deductive "proofs" and argues that historical arguments are enough to make a clear case for Christian theism. As one can see, the heart of the book lies in a defense of truth and the human ability to come to true beliefs. And this aspect of the book is strong. Feinberg's discussion of objectivity is worth the price of the book along with his analysis of Wittgenstein's epistemology. Feinberg's main skill lies in his ability to make conceptual distinctions and explore what we mean when we use certain concepts. He has a unique ability to linger in clarity rather than rush on to make his case for his conclusion. This ability makes his argument stronger, but it also means his writing is aimed at educating the reader and not merely arguing for a certain position. One weakness of the book worth mentioning is highlighted by a compliment Feinberg pays to the presuppostionalist school of apologetics. Feinberg praises presuppostionalists for grounding their principles and practice in the teaching of scripture. One wonders how Feinberg might deal with key passages that relate to defending the faith. What, for example, does Peter mean when he tells the believer to give a reason for her hope (1 Peter 3:15)? How would Feinberg reconcile his own strategy with that of Paul's strategy in addressing the Athenians (Acts 17)? I am sure that Feinberg does not build a picture of human knowledge devoid of scriptural underpinnings, but he does not tell us what those underpinnings might be. A weakness I will deal with in another post is Feinberg's analysis and criticism of presuppostionalism. Feinberg offers a slightly misguided analysis of presuppositional method. This leads him to make criticisms of the method that miss the mark.